Auto Meter is incredibly excited to announce their Spring Into Summer Rebate program for the months of May and June. This unprecedented savings event is the largest promotion of its type in our 57 year history of building the world's finest performance instruments. 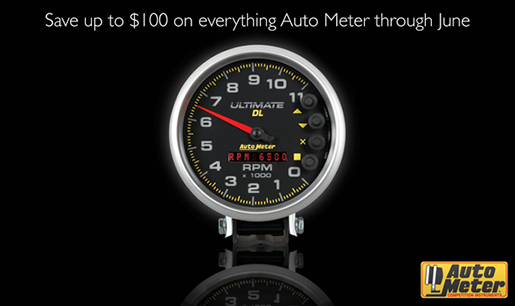 Through the end of June, all Auto Meter purchases can qualify for up to $100 in rebate savings. Simply purchase any Auto Meter product(s) from an authorized reseller and send in your UPC, a copy of the receipt and the rebate form. We'll mail you out a check (it really is that easy). This limited time offer is your best opportunity to save big money on the Auto Meter gear you need. Act now, because once it's over, it's over. There has never been a better time to get your hands on top of the line instrumentation. Check out the REBATE FORM AT THIS LINK for more information!